Unfortunately, its a bad news for Galaxy Note 9 users as the Samsung delayed a major upgrade for the flagship phablet. Galaxy Note 9 released back in August and is certainly one of the best phones of 2018. 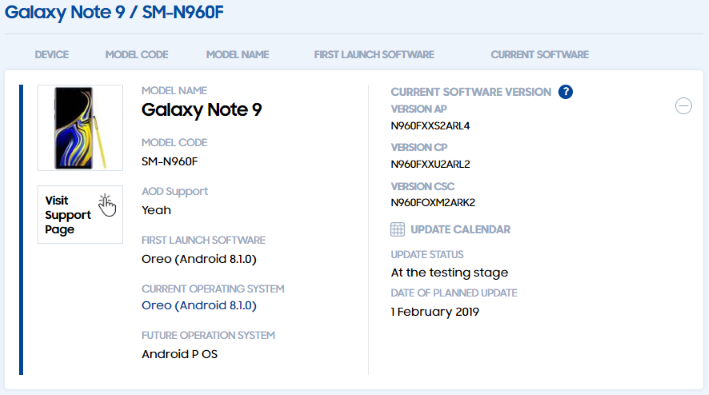 Even though the Galaxy Note 9 debuted in August, the same month Google released Android 9 Pie, the phablet arrived pre-installed with Android 8 Oreo. However, the tech giant has updated its Members application with a revised set of delivery dates for the latest and greatest Google software. The Samsung’s Turkish portal Guncelmiyiz indicates the update will instead roll out from February 1st. The Guncelmiyiz website, which Samsung owns, has updated estimates for many of the company’s devices. It currently says the Galaxy Note 8, S8, and S8 Plus Pie updates will roll out from February 15 and it previously said the Note 9 Pie update would roll out January 15. The Note 9’s update has evidently been delayed, as you can see in the screenshot below. It's not clear what caused the delay, especially considering that some users are already running the stable version of Pie. Beta testers in Germany got it first on January 4, followed by regular users in the UAE on January 12. And some on XDA have manually flashed the ROM. We are not seeing any reports of issues with the Galaxy Note 9 from people who have updated to Pie.